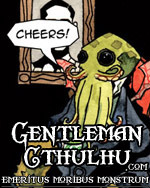 Published as a comic, with art by J. M. DeSantis, in Planet Lovecraft Magazine #4, June 2009. Panel 1. This panel being reserved for the title and credits of the story. It spans the whole width of the page, but is very thin, top to bottom. Panel 2. We begin our tale by opening upon a lone, early twentieth century home, as seen from a distance. The hour is late, and the sky is dark. Deep shadows fall upon the house’s exterior, throwing it into nearly complete silhouette. Though, despite the hour, it is quite obvious that some one at least is awake, for one of the windows there is lit as though by candle light. Panel 3. Here in panel three we are introduced to our narrator and protagonist (nameless here, forevermore). He sits at a desk in his study, reading a letter by the light of a candle standing upon his desk. Other than this, there is no other light to illuminate the room. Much of the study goes unseen in the darkness, adding to the feeling of mystery and hidden, unnamable things. Though, that is not to say the candle’s flame is not sufficient to cast some light upon at least a few of the objects within the room. Indeed, by it may be seen a great bookcase stacked full of volumes of all sorts and sizes, and shelves lined with other odd bits of things. On the wall behind the narrator can be vaguely glimpsed the mounted head of an animal – most specifically a lion (here representing Lovecraft’s Zodiac sign, Leo), and also the stone surface of a marble bust of Howard Phillips Lovecraft himself. Most importantly of all, however (the significance of which will soon become apparent) are a small, framed photograph which we cannot yet see the details of, and a yet unidentifiable miniature bust of an Egyptian pharaoh. As per the narrator’s physical description itself, he is very much a man of his times, and that being specifically 1926 (as the narrator will very soon state). He wears a suit and tie, with vest, though his jacket has been removed in favor of comfort. On his face he wears a pair of spectacles and has no facial hair. The age of the narrator is not too specific, being somewhere betwixt his late twenties and early thirties. Panel 4. A closer shot of our narrator as he continues to read the letter in his hands. His face is nearly expressionless, despite, what may seem to us, the unusual contents of the letter. If anything, he reads with stern interest, but nothing more. Panel 5. Over the shoulder of our narrator as he places the letter upon the desk. Just to the side of him we now see the previously mentioned photograph, though still not entirely clearly as we are yet a considerable distance from it. All that we may see is that in it is pictured the suited aspect of an older and mustached gentlemen. Panel 6. A close up of the photograph itself. Here we see clearly for the first time the uncle of our narrator. He is, as may be guessed and was briefly described before, considerably older than the narrator, being middle aged, and he wears a mustache upon his face and a suit upon his body. The man pictured is seated in a chair and in the background of the photograph are the shadowy shapes of various strange artefacts of many different bygone civilisations. Panel 1. Looking up from the letter, the narrator gazes about his study. Panel 2. From the narrator’s perspective, we may vaguely see more of the room in which he sits. Upon a great many shelves are placed a number of books and artefacts thrown into deep shadows by the faintly flickering light. Their titles and likenesses speak of the various cultures his uncle was like to have visited and studied. Here a volume of a Greek philosopher, there a painted African mask. Though all of them of cultures known to have existed. Yet amongst these things are (separate from one another) also a bust of the Magna Mater, Cybele, and a picture (perhaps not entirely seen, being partly cropped by the panel’s border), labeled, of the unutterable, Nyarlathotep. Panel 3. The narrator now turns his gaze to an object standing upon his desk, placing his hand upon it affectionately. It is, as we see, the aforementioned miniature bust of the Egyptian pharaoh. More specifically, it is the carven head of Kephren. Panel 4. Standing from his chair, our narrator begins to put on his suit jacket. Panel 5. Close up of the narrator’s hand as it lifts the candle from the table. Panel 6. The narrator now walks to the door of the study, his hand upon the doorknob. To his left stands an object clearly seen to be the representation of some ancient god. Its torso is that of an ancient Sumerian man, while its lower half is as the scaly body of a fish. Upon his head rests a crown fashioned in the likeness of some deep-sea creature. This is a statue of none other than the fish-god, Dagon himself. Panel 7. Close up of the face of the Dagon statue. Golden light spills upon its features to the right as the narrator moves beyond the door. Though, given the closeness of this panel, only the top left corner of the open doorway may be seen. Panel 8. Same shot. The door now closed, the statue is given a sinister aspect by the deep shadows and faint, blue light which falls upon it.